Polluted stormwater runoff is the number one source of water pollution in North Carolina. We work with government and community-based partners across North Carolina to address water quantity and quality issues related to stormwater runoff. Stormwater runoff is water that collects during rain and snowmelt. When precipitation does not soak into the ground or evaporate, it travels along hard surfaces such as pavement and roadways and is channeled into storm drains. 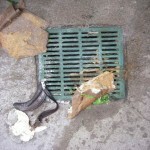 Storm drains connect to an underground network of pipes that ultimately release the stormwater to surface waters such as lakes and streams. 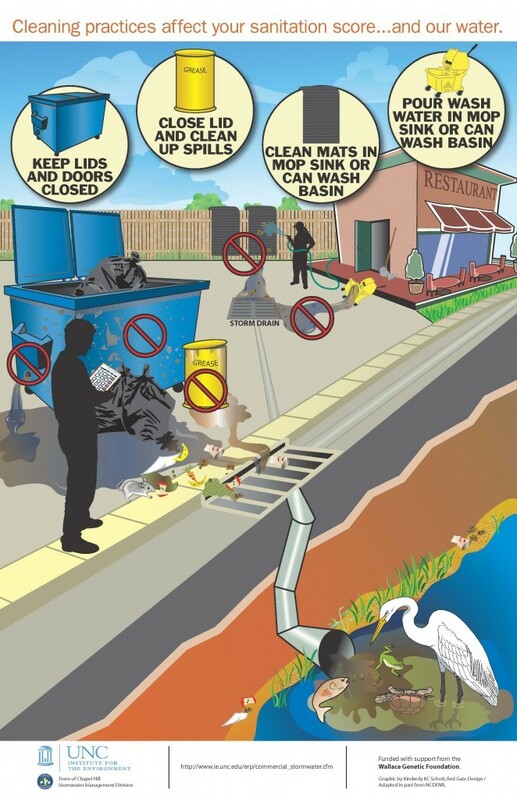 During its travels, stormwater can accumulate and carry chemicals, trash, and other debris and deposit these materials in the waterways where it is released. One way to avoid chemicals, trash and other debris ending up in our waterways is to prevent pollution from going down storm drains. Beginning in 2009, the UNC Institute for the Environment (IE) partnered with the Town of Chapel Hill’s Stormwater Management Division to improve stormwater management in the commercial sector. An advisory committee comprised of stormwater and business professionals identified the food service industry as one of several important commercial targets for educational efforts. Six focus groups were conducted with restaurant managers and staff to determine their knowledge of restaurant impacts on water quality and the most effective methods for educating food service staff. Information gathered from the focus groups and the advisory committee guided the development of educational videos and posters in both Spanish and English. Training format, dissemination of materials and response to training materials are being evaluated to establish the most effective ways to reach both the restaurant managers and kitchen staff. Funding for this project was provided by the Wallace Genetic Foundation. Food service establishments are receiving water pollution prevention training by participating in one hour workshops or receiving on-location training by town stormwater and county health inspectors. Training materials are also available below to download or order hard copies. Food service managers, public health professionals and stormwater educators are encouraged to use these materials.